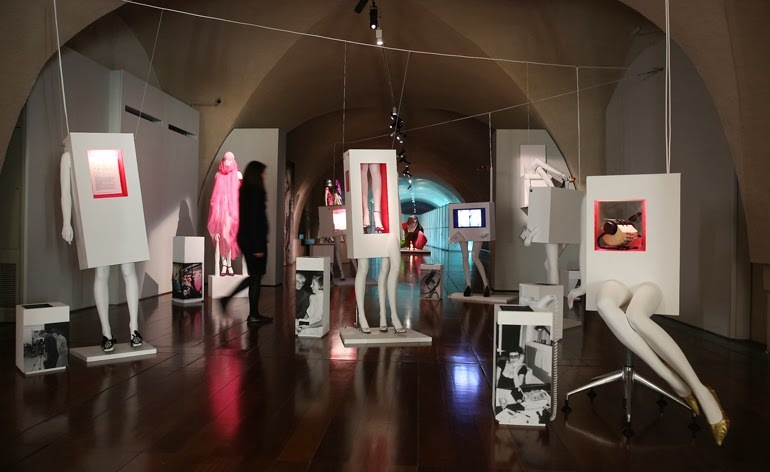 Over the weekend I had the pleasure of visiting the Isabella Blow exhibition, Fashion Galore, at Somerset House, London. Isabella Blow in glorious red. 1997 Photo Mario Testino. I’ll be honest. I have only recently discovered who she is. Quite a few years ago (I just looked at when and it was in 1999! ), whilst on the way back from Paris with a friend of mine, we did actually glimpse Isabella with her husband, Detmar Blow. My friend said – look, look, there’s Isabella Blow and her husband!! 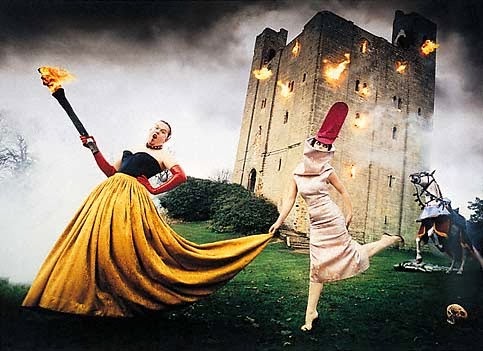 At that time, not knowing who she was and what a powerful force she was in the fashion world, I had replied ‘Who’s Isabella Blow?’ looking in her direction. I could see a striking figure ahead of me, exuding a powerful presence. I'd completely forgotten about this until last year. On my way back from Morocco last November, I happened to be reading an article by Philip Traecy, the Hat Architect, about Isabella. I was fascinated by what I read. I was also saddened to read that Isabella had taken her own life in 2007 at the young age of 48. I wanted to know more about her. I also thought - how could I not have known more about her sooner?! So I spoke to my friend who I’d been to Paris with all those years ago, and we, along with another friend, met up to go to the exhibition together. So the photos I have shared here have been borrowed from the Somerset House Site. Credited of course. Other than the very last photo. That one I did take. So, rather than describe the exhibition I’m going to highlight the parts that sang out and inspired me. Loved to write in pink ink with her waterman fountain pen. This reminded me how much I used to love writing in orange ink. Time to get myself an orange pen again! Really wore her clothes. Each item has some wear and tear. Her wardrobe wasn’t filled with museum pieces. She brought each piece alive. Liked wearing odd shoes. This was how she met Andy Warhol in New York. He spotted her odd shoes and invited them to dinner. I love the quirkiness of that story! Championed Britsishness. In the film clips played during the exhibition I noticed that in each one this was something very important to her and that something she was very passionate about. Capturing the Englishness and the fact that great things were happening in London. Wore red lipstick and loved the shade Coromandel by Chanel. Had a real eye for talent. She could see greatness in others and nurtured it. 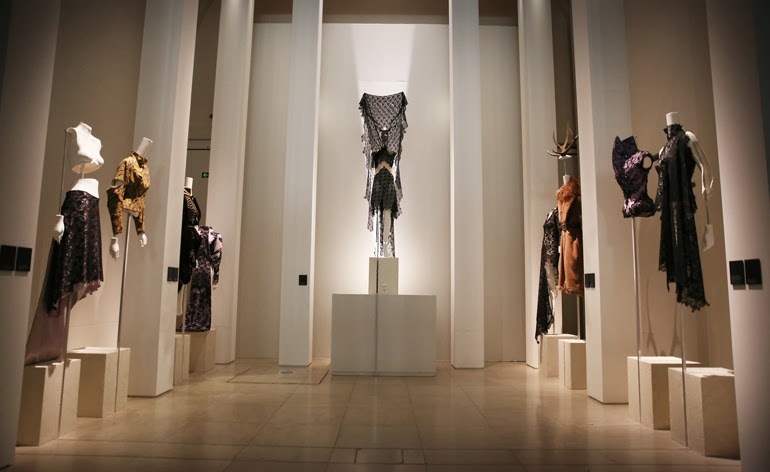 Discovering young talent such as Philip Treacy, Alexander McQueen and Sophie Dahl. She encouraged them and championed them. A true mentor. Stood up for what she believed in. Took risks. Buying the complete collection of Alexander McQueens graduate collection for £5,000. Money she didn’t have. Then paying him £100 a week until the sum was paid in full. Used hats to hide but also to stand out. In one of the films she talks about how wearing a hat ‘can make you appear more beautiful than you are. By lifting you up.’ They were also a ‘shield’ as one might wear armour during a battle. These of course are my own personal thoughts, and what I learnt from seeing the exhibition. As I said I wasn't really very familiar with her or her work until recently. Her zest for life and her colourful exuberance were brought to a close by her own hand, so yes the exhibition was tinged with the scent of sadness. There was obviously great pain behind the colour, and from what I have read, understand that she had been let down by the industry she had loved and supported so passionately. There is more to know, and I’ll be reading her biography, written by her husband as soon as I can get a copy from my library. I felt truly inspired after visiting the exhibition and a boost to my own sense of discovering my own ways of being BOLDER, BRIGHTER and to keep following my own path. Thank You Isabelle Blow for not being afraid to be you. Well, other than this one. 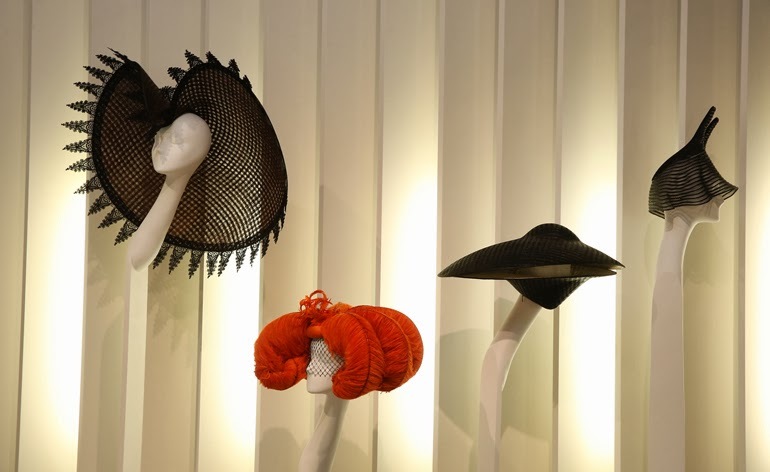 Hi Morwhenna thanks for sharing this, I love the hats and the general spirit of her work!